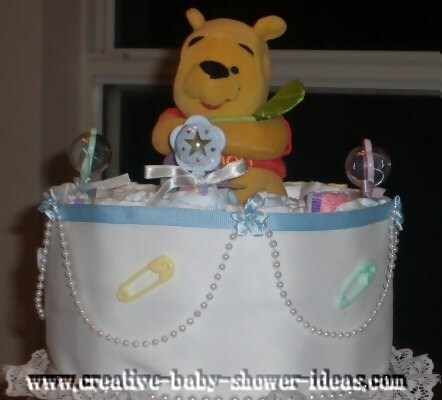 Create a wonderful Winnie the Pooh diaper cake using the ideas compiled in our reader gallery. Our wonderful readers sent in these photos to help you as you make your own cake. We hope all pictures in this gallery to help give you fabulous ideas for your own creation. 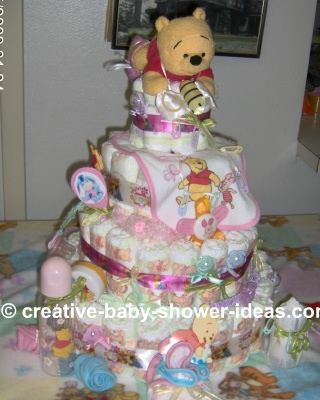 This Winnie The Pooh cake takes about 58 diapers for the first tier and about 21 for the second tier. 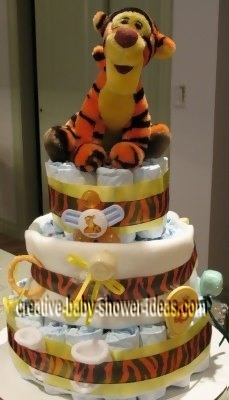 Add some Winnie The Pooh items such as onesies, bibs, a blanket, and some usual baby items: lotion, powder, baby wash, etc. An 8 oz. bottle holds it all together in the middle and a cute Winnie The Pooh musical stuffed animal tops it off. 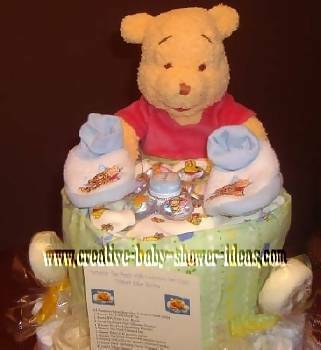 This Winnie the Pooh diaper cake is made with 100 diapers, two decorative tin cans (filled with cookies), a pooh rattler, pooh pacifier, pooh photo frame, two piece infant wear, pooh wrist rattler, a pooh security blanket, a pooh 8 oz. bottle, a pooh good night book and a pooh soft stuffed bear. 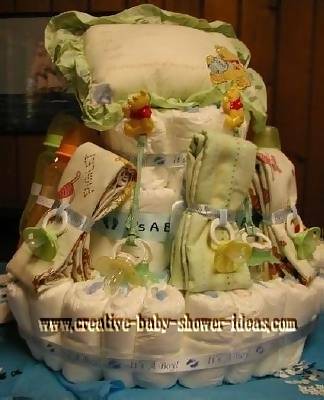 Here is the first diaper cake I've made. I'm pretty happy on how it turned out. 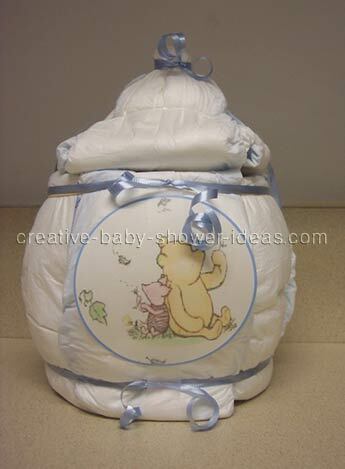 Ingredients: 44 Huggies Pooh Bear diapers all rolled up with clear rubber bands; 3 8 oz. 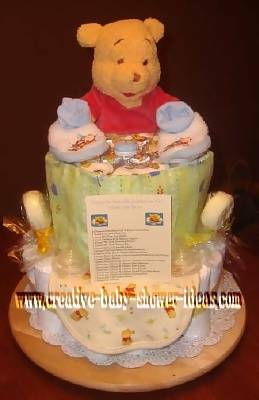 Pooh bear bottles in center to hold together tiers of cake; wrapped layers of diapers with curling ribbon, then with 4 flannel Pooh blankets to give "frosted" cake look; tucked in 1 infant cap, 1 sleeper, 3 bibs, 2 pacifiers and a pooh bear rattle. 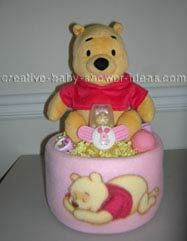 Topped with Pooh Bear plush toy. 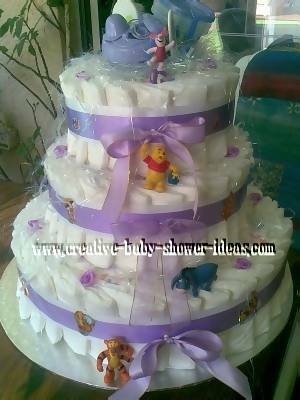 Place "cake" on a silver platter decorated with Pooh Bear & Friends stickers - though can't see any of it when cake sits on it. Finally wrapped it in cellophane and pink curling ribbon. 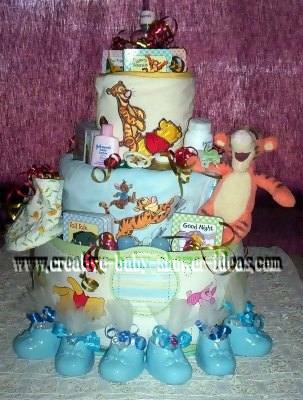 I used a Winnie the Pooh theme centered on the "First Pooh Stories" book set. It's never too early to start reading to your bundle. I took a cardboard box and cut a circle to fit the size of the bottom of layer. The cardboard circle was wrapped with light blue tissue paper. I rolled 50 size 2 pampers and secured each one with a clear hair tie. I rolled 45 size 1 pampers for the middle and top layer. Each layer was set around a 4 oz. bottle. As I made a row I tied it with white yarn. Then the next row until the whole layer was finished. The bottom layer I wrapped with a size chart made of cloth which I fastened by hand sewing a little knot on the top and bottom of the size chart. 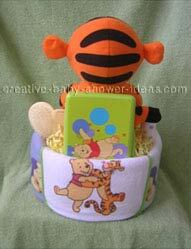 The middle layer was wrapped with a baby blanket that was folded in such a way as to expose the Tigger applique. That was also sewn together. 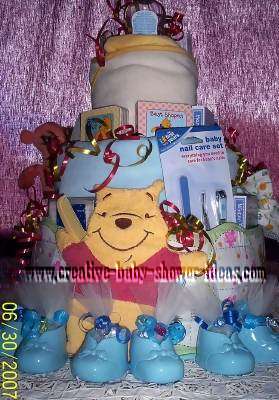 The top layer was wrapped with a baby bath towel also in such a way that the Winnie applique was exposed. After wrapping each layer I took 3 plastic rods the height of the 3 layers and set them strategically inside the layers so that the cake will not topple. Next came the fun part... decorating. I took the books and nestled them inside the exposed part of the layer. Additional accessories were necessities as well as fun items. Necessities were small baby lotion, oil, and powder, nail clip set, baby brush, cotton swabs. 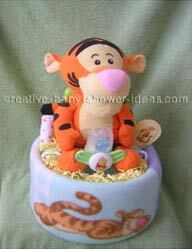 Fun items included booties, 2 pacifiers, bath mitt, 2 bibs, and a Tigger rattle (he's hanging on). I trimmed the cake with gold and red curling ribbon. 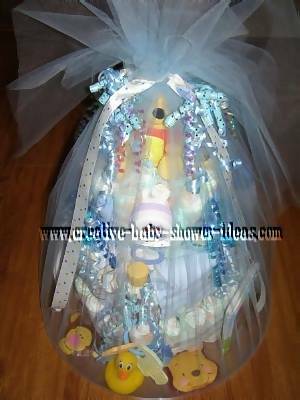 The bottom of the cake was lined with baby bootie party favors which contained kisses candy wrapped in yellow tulle and tied off with blue curling ribbon. This cake was made for the baby shower of my co-workers wife. 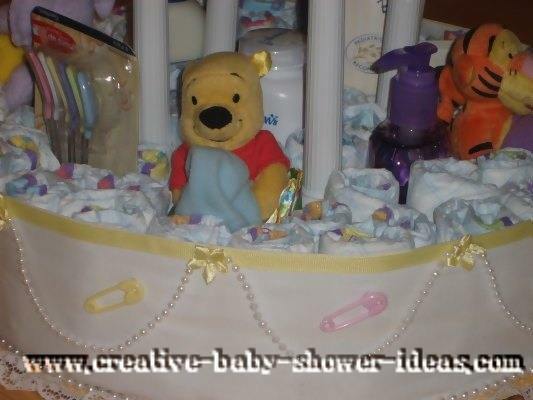 I made a Baby Girl Pooh Cake for my daughter's shower, using your site for inspiration- many thanks! 50 size 1 Pampers, rolled and secured with 50 small pink ouchless hair bands that the baby can use later. For the bottom layer, I secured two layers of rolled Pampers around a paper towel tube using ribbon. I snapped the bibs and strung them over the paper towel tube to secure, and spread them around the bottom of the cake. I added pink ribbon and placed 4 bottles of the Johnson's products in between the bibs. 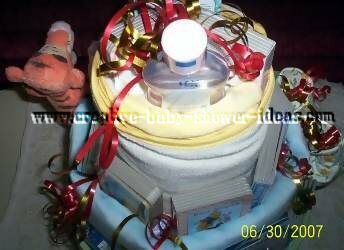 For the second layer, I again secured Pampers to the tube with ribbon, placed 2 hats and the pair of booties around them and secured with white ribbon. I used curling ribbon tied around each scratch mitt to make rosettes and placed along the sides, securing with 2 sided tape. For the top, I used the rest of the Pampers and draped a burp cloth over the top, tucking excess material into the "hole" in top, inserted the Pooh rattle in the center, and added two more scratch mitt rosettes. I secured the outside with ribbon and tucked two packets of Johnson's products in the sides. The cake was placed on a foil deli tray, decorated with leftover ribbon. Eeyore is sitting alongside, holding his own gift- a pacifier. 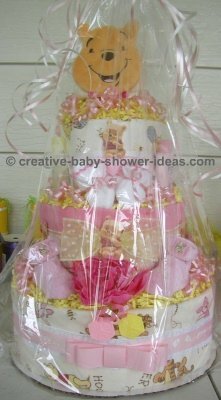 I made this Diaper Cake for my stepdaughter's Baby Shower. 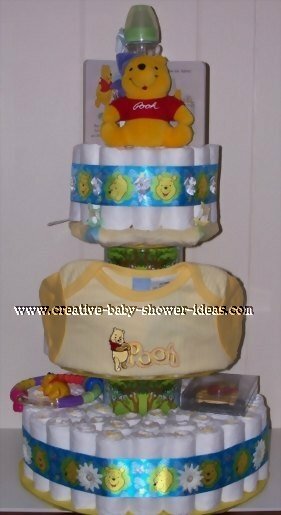 After checking out this site, I was inspired to make a diaper cake for my daughter's shower. I am pleased with the results. I hosted my very first baby shower party in Feb for a friend. 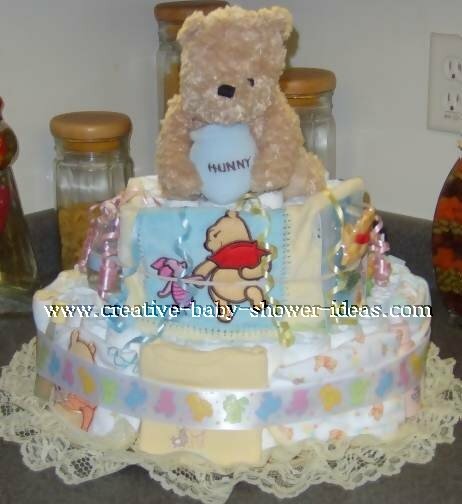 I browsed the internet for ideas and have never before heard of a "diaper cake" (no kidding). I come from a different country where baby showers are celebrated differently. 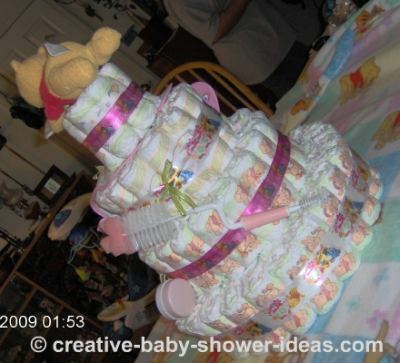 At first, I thought it was a real cake shaped like a diaper only to realize it was a real diaper cake. And I got hooked to the idea. I thought about ordering online but it was too expensive and I said, why not make one? 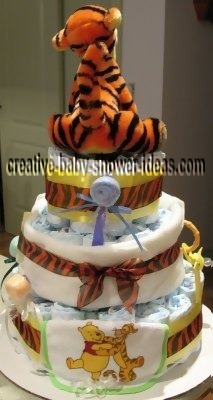 I got my creative juices flowing and made my very first diaper cake, which was an instant hit. The party was a success. Most of our friends have never been to a baby shower (US version) before and we had so much fun. I included games which involved the husbands also so they were not left out. I also surprised the mommy-to-be with a personalized signature frame with her in a bikini taken when she was in her 16 weeks of pregnancy. I also arranged with her husband to have him call family from home to send email messages to her. It was an emotional moment. Thank you for inspiring me! 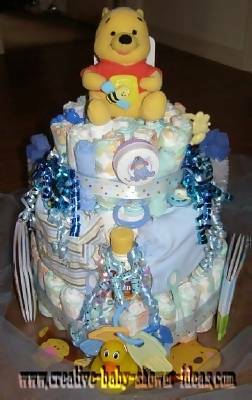 Photos of my very first diaper cake! The mommy-to-be liked Winnie the Pooh (so did I) so I was inspired to make her one. 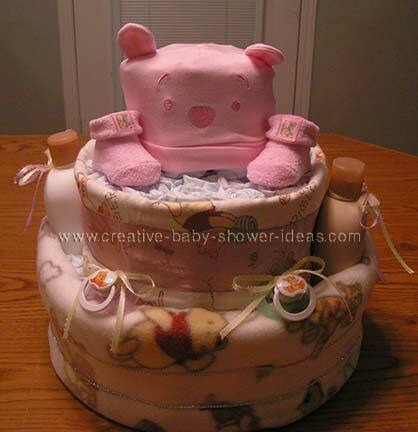 The cake has 3 layers and inside I inserted little J & J baby products. I found it easier to use baby bottles as my center for all the 3 layers. That way I won't have to pin my layers. Around the cake are my party favors. They are Hersheys kisses wrapped in tulle and ribbon. 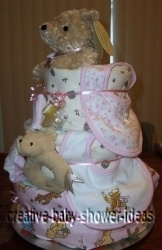 This diaper cake was done because we weren't sure of the baby's gender. This is a three layer cake, done by using neutral items. 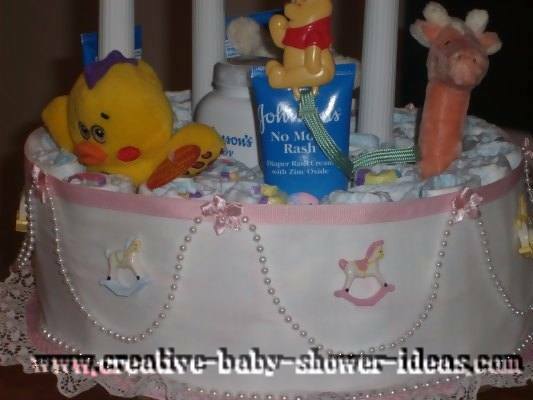 This was done for a diaper shower theme. 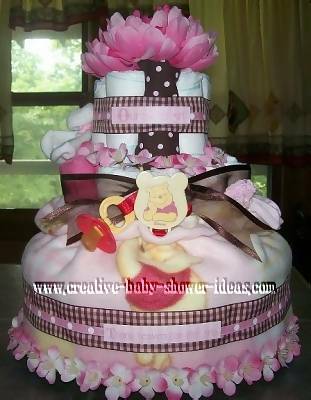 I started with rolling out the diapers for the first layer of the cake then I rolled the second layer then repeated with the third layer got a cake plate put the first layer on it got real cake columns to attach the layers on top of each other made the adjustments to straighten the layers on top of each other. 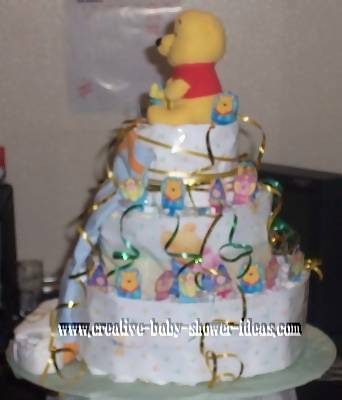 I placed the lace around the layers with double back sticky tape place Winnie the Pooh as a topper and as of his friends I place them all over the cake. 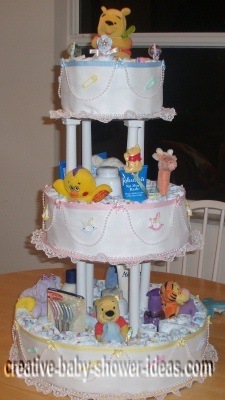 I stuffed the cake with lots of items for the new baby. I used 150 size 1 diapers and lace. First off I used an old Formula can as my base. I then laid diapers all around the can and secured them to the bottom of the can using a rubber band. I did the same to the top of the can. I then covered the rubber bands with ribbon. For the lid, I actually used the lid but wrapped it in a diaper and created a knob. I placed tissue paper inside and stuffed it with baby items. 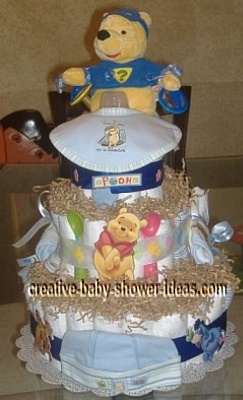 I went online and found a nice Winnie the Pooh image, cute it out and taped it on. 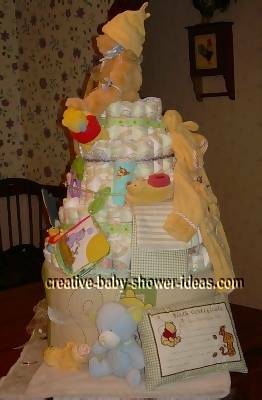 This is my first ever diaper cake and I am really happy with it! It's for a baby boy but I think it's somewhat neutral. 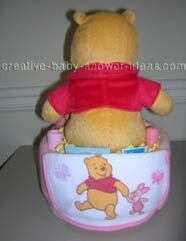 I used a whole box (96) of Huggies newborn diapers which have a Winnie the Pooh and Friends design. 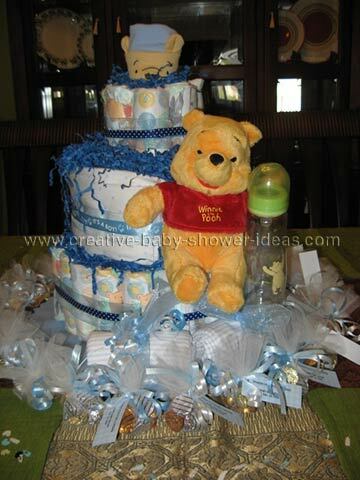 Each layer of diapers is covered with a sheer blue ribbon wrapped around twice. Then a thinner ribbon was tied around each layer to cover the rubber bands that hold the diapers together. It's made entirely of diapers -- there is no core in the middle. There is one dowel rod stuck in the center to hold the layers together. It is all placed on a 14" disposable plastic serving tray. The topper is a Winnie the Pooh blanket/teether toy that I tucked under it. Thanks for the inspiration on your website -- I can't wait to make more!! This is a photo of the cake that my fiance's Grandmother made. Our whole baby theme is Winnie the Pooh. It took us about 2 hours to make this we really enjoyed making the cake. This is our first child. Hope you guys like. 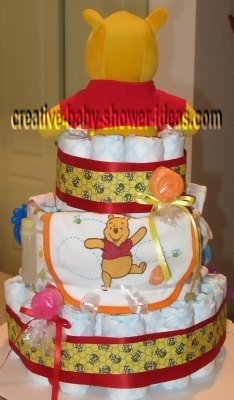 Here is a Winnie the Pooh diaper cake I made for my sister's baby shower. 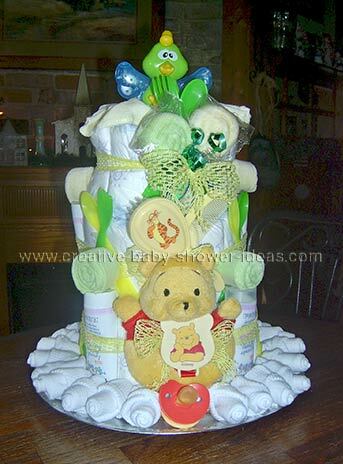 This cake is made from 1 pack of Huggies size 1 diapers and 1 pack of pampers size 1 diapers. 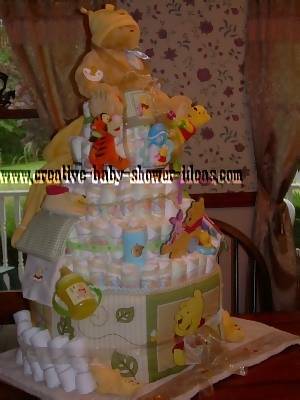 I used a paper towel role in the middle and used Huggies baby bath and lotion on the bottom level with diapers around it. On the second layer I used 3 onesies to cover the diapers. I used a platter for the bottom. 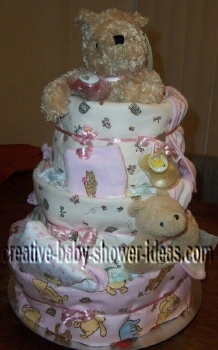 My 1st Diaper cake! I didn't add a lot of accessories since I was a newbie. 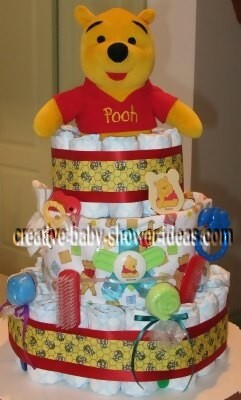 :) I used Huggies size 1 and 2 diapers with a Pooh print. I figured it was decoration enough. This one was made over a year ago, and since I have made 5 more for friends and family! 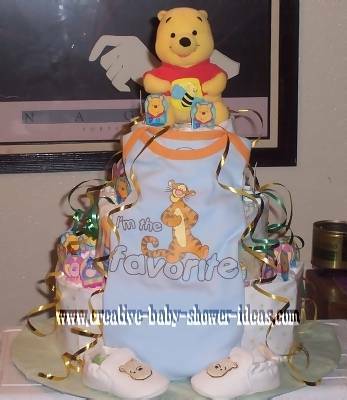 Here is my most recent Winnie The Pooh cake. 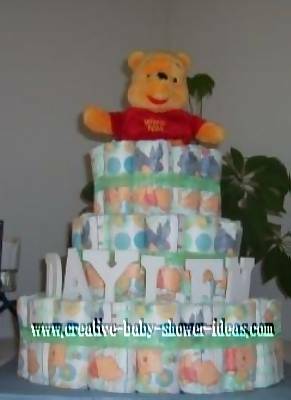 My mom and I made a Winnie the Pooh Diaper cake for my little sister's baby shower. It has well over 100 diapers in it. It has 4 layers and in the middle of them are 2 8 oz. bottles and the top has a 4 oz. bottle. We rolled the diapers up and used rubber bands to hold them all together. The ribbon is hiding the rubber bands. 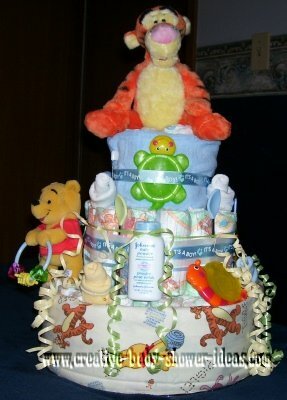 This is one of my custom diaper cakes someone ordered from me. She requested a Winnie the Pooh cake for a girl (obviously). 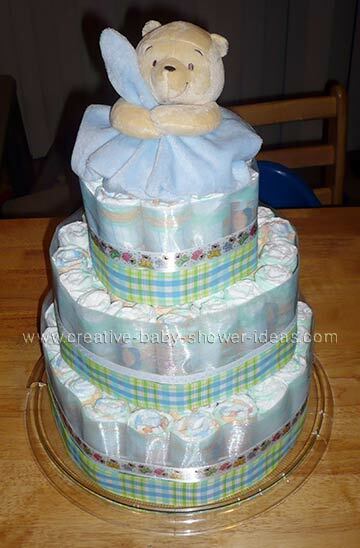 It contains 60 size 3 Huggies (I use larger size diapers so the Mom can enjoy the cake a little longer. ), 1 pr. booties, 1 pr. mittens, 2 onesies, Winnie the Pooh pacifier and clip, burp cloth (on back side), and winnie the pooh bottle inside stuffed with pink jelly belly beans (for the Mom to be). I use flowers on my custom cakes, the basic cakes I use the shredded craft paper to look like icing. I also make towel cakes for all occasions too. 1ST TIER (BASE TIER) I used a Huggies Mega size Refill Bag of baby wipes lying lengthwise on the board. 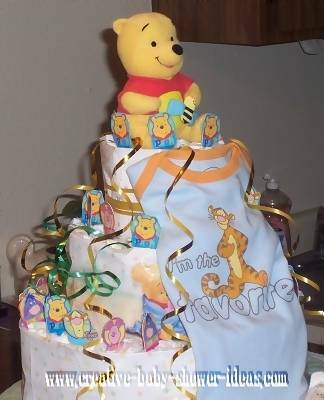 Next I folded a plush blanket lengthwise to wrap around the baby wipe bag then around the I used a crib "bumper and wrapped that around the blanket making sure Pooh's picture was lined up on the front of the cake. The ties for the bumper for the crib were helpful to tie the bumper layers to themselves to keep it together and tight. I also stuffed gifts in any holes which may have remained, a small photo album and a "tooth fairy pillow" etc. Next I placed a Newborn 30 count diaper bag on its end to use as the center core for the 2-4 tiers. 2ND TIER I used the Blanket from the crib set and also folded it lengthwise to wrap around the 30 count bag of Newborn diapers which is standing up vertically on its end. adding more gifts to fill in any holes. then I started to place the rolled diapers inside the first wrap layer of the bumper on the based tier keeping the diapers sticking 2/3 out the blankets on the inside keep the diapers in place until the decorative thin ribbon is placed around the diapers and tied very snug on the backside of the cake. Next start placing the 2nd tier outside layer of diapers just at the edge of the first tiers diaper rolls. 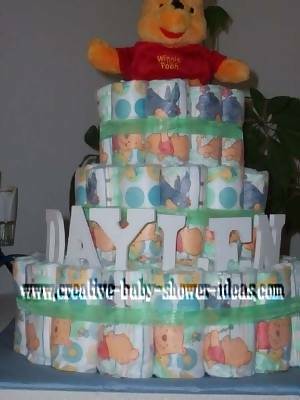 (only 1 full rotation of diapers were needed for the 1st and 2nd tiers. 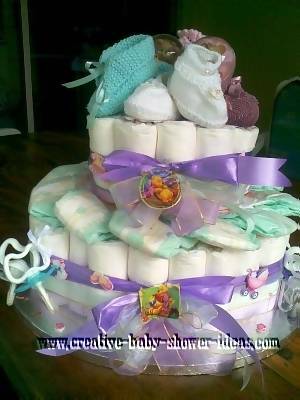 The 3rd, 4th and 5th tiers require more rotations of diapers)Finishing it off by using a decorative Ribbon wrapped around the tier to hold the diapers tightly together and tie a snug knot in the back of the cake. 3RD TIER still has the 30 count bag of diapers as the center filler and I used the crib sheet and folded it lengthwise and wrapped it around the bag of 30 count diapers and also you could use a few "Onesies" if needed to fill in any holes. Start your rotations of rolled diapers from the center and working out. Just to the edge of tier 2. Again use a decorative ribbon to wrap around the tier and tie snug knot in back of cake. 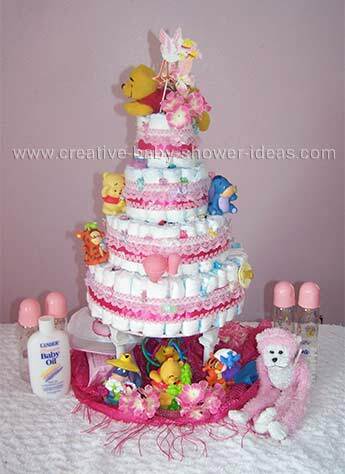 4TH TIER: I used 2 bottles of Huggies baby wash and Huggies baby lotion. Placing them back to back and using 2 THICK elastic bands, one toward the bottom of the bottles and one toward the top. again start rotations of diapers working out from the bottles which are in the center until the edge of tier 3 is reached. 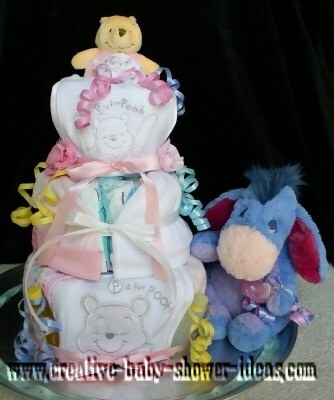 This time instead of wrapping ribbon to secure you will first use a Medium size Rubber band and place it around all of the rolled diapers then cover the rubber band with decorative ribbon and also tie it snug on the backside of the cake. Repeat for the next and final tier _5TH TIER. 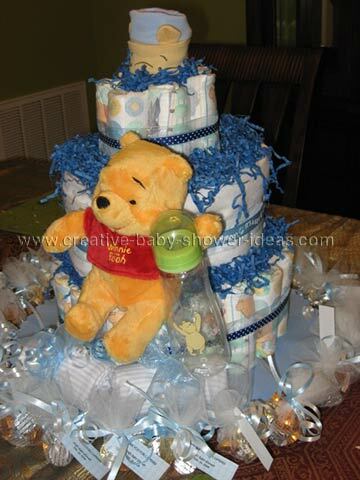 Finally decorate the diaper cake according to a theme- mine being Winnie the Pooh for a Boy. 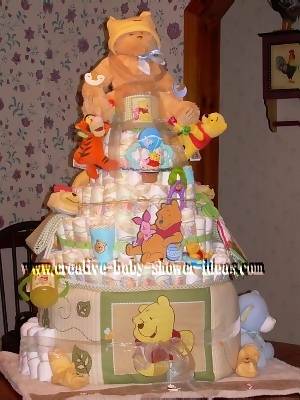 Basically this diaper cake is much more... It resembles a Pinata with all of the gifts hidden inside as well as on the outside as decoration. This is my first nappy cake which I make for my daughter in law's baby shower. Having done this one I have received a number of requests to create more, thanks to your wonderful website I have been able to do this.